It was the best game played by the Tomahawks WBA in this season although the team was incomplete (Centers Emma S and Izola A were not present). Tomahawks Lydia S was their top scorer with 12 points followed by team captain Gloria H with 9 and Rookie sensation Monde S with 8. On the Poly Dodgers side, Elina a scored 14 points followed by Janet B with 8 and Claudette G with 7. The T'hawks had a slow start but they showed the Titans at the end of the game that they are willing to got to the playoffs unbeaten! Titans' Paulus H was their top scorer with 24 points (4 x 3pt) followed by Ruben I and Adeyemi S both with 13 and team captain Corbin P with 10.
as for the T'hawks, Freddie A lead all scorers with 26 points (4 x 3pt) followed by Luis A with 22 (6 x 3pt) and Paulo C with 14 (1 x 3pt). Starzz's Tessa A scored 17 points followed by Chenai D with 14, while their Rookie sensasion Tweety scored 7 points. On the Flames side always on fire was Vickey K with 23 points and the reputation that precedes her, "Rebound Queen"! The Rebels beat the Suns in their best shape, as 2004 Season MVP was fouled out when there were 6 minutes left to the final whistle. There is a word out for the Suns, "THERE IS NO 'I' IN THE WORD TEAM". Rebels' Nigel M scored 23 (2x 3pt), followed by Brian H with 19 points and Isak N and Mao M both with 15 points. On the Civics side, Eric N (Junior) scored 32 points (3 x 3pt), followed by Mpume H with 28 (3 x 3pt)) and Coulson J with 14 points. The Carabinieri stormed past the Stormers as Mandume S scored 24 points followed by Paulus P with 23, J Shapumba (Shasha) with 19, S Justice with 16. The Carabineri fired successfully 12 3pt, of which 4 were S Justice's accuracy tactics. Last but not least, Paulus P AKA MJ crossed out John Brick M throwing the latter onto the floor and firing a successfull 3pt. The Stormers' Lauro C scored 21 points followed by John M AKA "John Brick" with 9 points (three 3pt) and Armstrong and Bruce with 9 points as well. 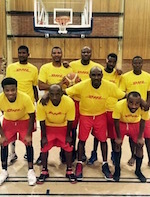 A forfeit was awarded to the UBC Stormers for administrative reasons.